BJP president Amit Shah, who has been on a three-day visit to Lucknow as part of his nation-wide tour. Lucknow: Bharatiya Janata Party president Amit Shah, who has been on a three-day visit to Lucknow as part of his nation-wide tour, on Monday highlighted the major achievements of the Prime Minister Narendra Modi-led government in the last three years. Addressing the media here, Shah attacked the previous government for being ineffective while listing the achievements of present one. 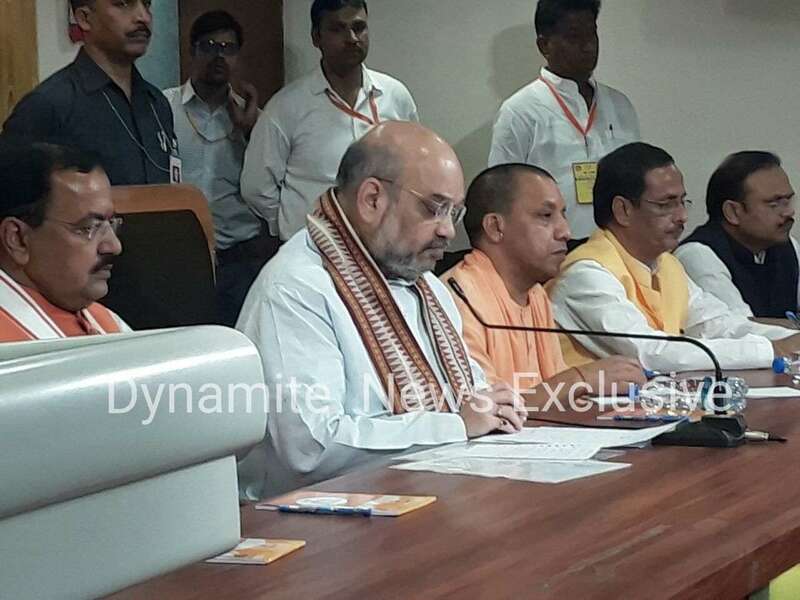 Maintaining that the current government has been so well managed and effective that the opposition has not been able to levy a single corruption charge against them, Shah said, "The Bharatiya Janata Party (BJP) has completed over three years in office at the Centre, and has completed three months in office in Uttar Pradesh, and in these three years, the country has seen a visible development. Under the previous government, every month, there were cases of corruption, but we have completed three years, and there is not even one case of corruption against us," he added. He said that the world has accepted that the Indian economy is growing rapidly. He said the "jobless growth" criticism was misplaced as the government has given employment to 7.28 crore people through the Mudra Bank scheme. Shah reminded the Other Backward Classes (OBC) that the "Modi government did a great job by according Constitutional status to the OBC Commission." Commenting on last year's surgical strike across the border, Shah said Prime Minister Modi had sent out a message that India is capable of protecting itself and giving a befitting reply to anyone. Talking about the other achievements of the Modi Government, he said that it has ensured electricity coverage in 13,000 villages and by May 2018 it will reach 19000 villages. "19000 villages in India didn't have electricity, and till now, almost 13000 villages have been provided, Before May 2018, all 19000 villages will have electricity," he added. The BJP chief said that the Indian Space Research Organisation (ISRO) has launched 104 satellites into orbit under the present government. "ISRO used to work before also, but the launching 104 is something incredible," he added. He also said that Prime Minister Modi's government sanctioned One Rank One Pension within a year of its governance. The BJP chief also highlighted the Swachh Bharat Mission and said that "due to the prime minister's initiative, over four crore toilets have been constructed across the country". On hearing the news of the Gujarat Congress MLAs being shifted to a Bengaluru resort, Shah said it seemed as if the Congress does not trust its MLAs. "Why have they been made prisoners?" he asked. He also rejected suggestions that the BJP had engineered Bihar Chief Minister Nitish Kumar's resignation last week and also his decision to get back into the NDA fold. He said Kumar himself had ended the Janata Dal-United's alliance with the Rashtriya Janata Dal (RJD) and resigned.